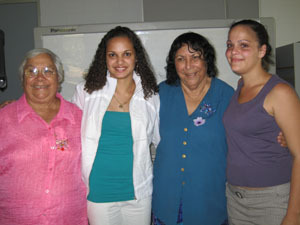 In May this year, the Indigenous Academic Support Unit organised an event to commemorate the National Day of Healing. The event, entitled ‘Aunties Talking’ featured Aunty Maria Tomlins and Aunty Florence Nicolls talking about their experiences growing up at the Garden Point and Croker Island missions respectively. The initial event was attended by students, staff, and community and proved very popular. It was decided to run the event again in the lead-up to the Vincent Lingiari Memorial lecture and as such, the event was held again on Tuesday, 7 August. Speaking to an audience of about 30 staff, students and community members, Aunty Maria Tomlins and Aunty Florence Nicholls recalled some of their childhood experiences at the missions, their evacuation to the eastern seaboard during wartime and how these events impacted upon their lives. The Aunties gave emotional and heart rending accounts of their experiences as survivors of the Stolen Generation and told their stories with humour, grace and spirit. Telling their stories again was difficult, but they both believe that their stories should be told so that people have an understanding of what happened in the past. Aunty Maria believes that the youth of today are still affected by past events. She was however, delighted to meet up with two ‘Garden Point’ grandchildren who are doing extremely well in their education and career goals, including Simone Liddy, a current Charles Darwin University third year pharmacy student and Etta Avlonitis, a current apprentice at CDU. Both Simone and Etta had grandmothers who grew up at Garden Point Mission, and they listened avidly to the Aunties’ stories.